A wonderful days flat racing on Saturday highlighted by the wins of Roaring Lion, Irish Champion Stakes at Leopardstown, and Kew Gardens in the St Leger at Doncaster. Roaring Lion is 2/1 with BetVictor to add the Qipco Champion Stakes at Ascot to his portfolio of Group 1 successes next month. Kew Gardens is 14/1 with BetVictor for Arc glory with Aidan O’Brien hinting that is where his progressive three-year-old will next appear. The racing career of the brilliant Alpha Centauri must be in the balance, however, after Jessica Harrington’s brilliant filly appeared to falter as she was coming to challenge Laurens in the Matron Stakes. Connections later reported she had suffered an injury to her right front fetlock. There is a good flat card at Kempton this evening and I cannot desert Dame Nellie (9.00) in the finale even though she was pulled out of a similar engagement at Newcastle earlier in the month. The filly won at Linfield from a 2lbs lower mark on her penultimate start under this evening’s pilot David Probert. The 3-y-old needs a proper test at this trip and there is no guaranteed pace in a race chock-full of three-year-olds stepping up in trip – I hope David Probert ensures a decent gallop. I like the booking of Adam Kirby for Fast Endeavour (6.00) in the 7f nursery. Trainer Michael Bell did us a favour with the nap at Musselburgh on Saturday (Artamon) and this juvenile was only beaten a couple of lengths off a 2lbs higher mark last time. Yes, he did finish last of six on that occasion, but the runner up has subsequently franked the form and he has an excellent draw in stall two. Kamikaze Lord (6.30) was just touched off at Ascot when well supported earlier in the month and this American bred colt can go one better on his first start on a synthetic surface. James Doyle takes over in the saddle. Division One of the Mile Maiden for 3-y-old’s + is a cracker and the filly Kynance (7.00) is taken to improve for the step up to a mile having just failed to catch Burford Brown over 7f at Newcastle last time. Her draw in stall eight is less than ideal, but I feel she can improve past the consistent Cuban Heel who is also having his first all-weather start. Mapped is only 3lbs higher than when easily scoring over C&D here last month but the time was slow, and I am willing to give Tenedos (8.30) another chance having been caught out of her ground when a staying on fourth over C&D earlier in the month. The gelding unshipped Josephine Gordon on the way to the start and was slowly away returning from an 11-week break. The hope is this course winner on debut can bounce back. At Worcester Peter The Mayo Man (3.20) has his first start for Dan Skelton and is taken to defy a mark of 141 in the valuable 2mile handicap hurdle. The selection has run well fresh in the past and can edge out Theo who represents the inform combination of Sam Twiston-Davies and Dr Richard Newland. There are a couple of interesting hurdling debutants on show today with Sofia’s Rock running at Worcester for the Skeltons’ and Four Kingdoms (2.00) at Hexham for R Mike Smith. 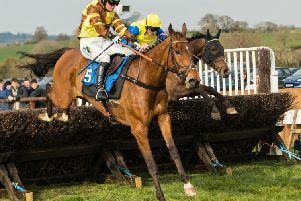 Those with experience don’t look anything out of the ordinary in the opener at the north-east track and this 70-rated flat horse has the scope to jump a hurdle for a yard who I have plenty of time for.